A new report from Forest Trends’ Supply Change project tracks progress on 579 public commitments from companies around the world who have pledged to remove forest destruction from their supply chains. These businesses depend on the “big four” agricultural commodities – palm oil, wood products, soy, and cattle – that are found in nearly every aisle of the grocery store but are also responsible for more than a third of tropical deforestation each year. 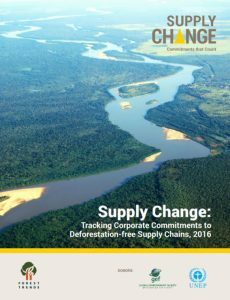 Supply Change: Tracking Corporate Commitments to Deforestation-free Supply Chains, 2016 looks at 566 companies representing at least US$7.3 trillion in market capitalization who were identified as having deforestation risk tied to these four commodities within their supply chains. Of these companies, 366 have made coinciding commitments to shift to sustainable sources.